Android RecyclerView is an important component widely used in Android apps. It is important to know how to use it and how to customize its behavior. 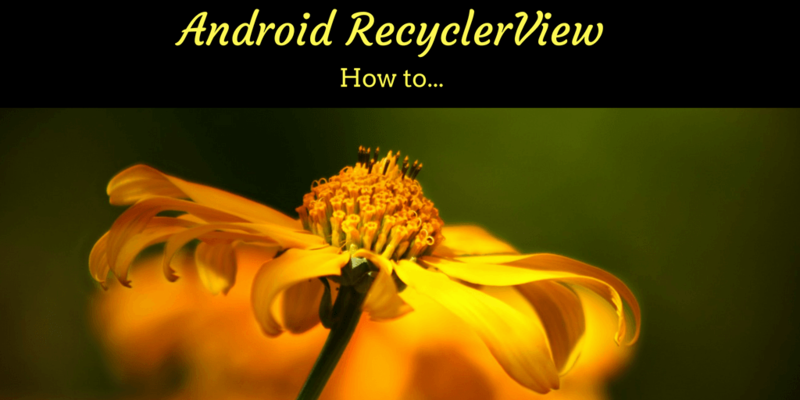 This tutorial will cover some important aspects of Android RecyclerView giving all the information you need to build a great Android app using it. As you may already know, Android RecyclerView is a new component introduced in Android Lollipop. 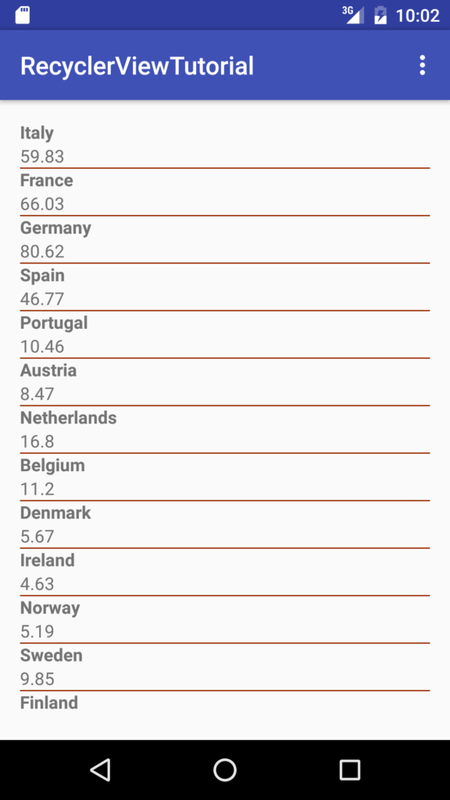 This component increases performances respect to Android ListView. Moreover, respect to Android ListView, Android RecyclerView is much more customizable using Android Recyclerview adapter. 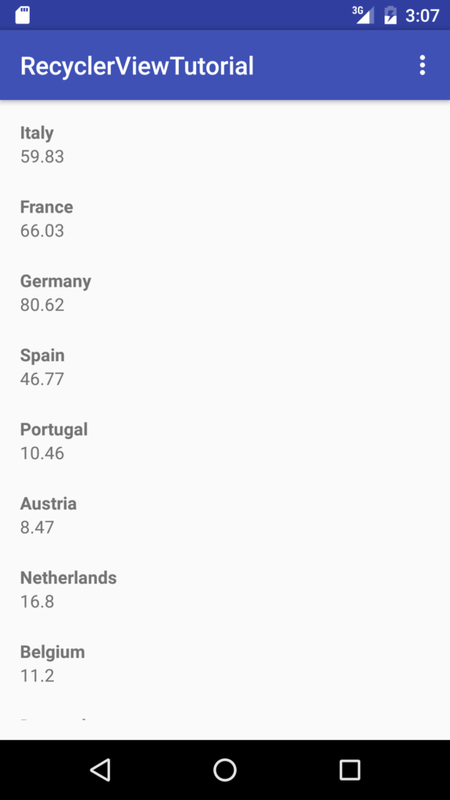 Android RecyclerView uses an Adapter to represent the information we want to show as a list. 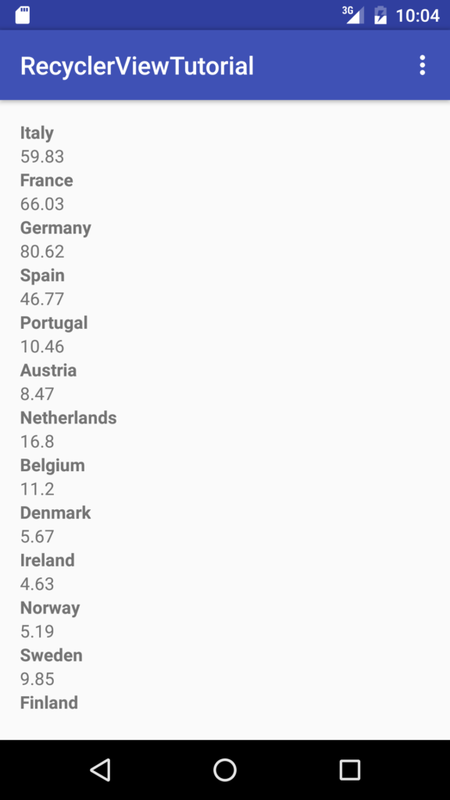 Even in Android ListView we use an adapter. Anyway, Android RecyclerView extends this concept and improves the way this adapter is used to increase overall performances. The adapter is a class that extends RecyclerView.Adapter and stands behind the UI and the underlying data we want to represent. For this reason, we have to customize it to use our class that represents the information. At this moment, the Android RecyclerView is empty, we have to implement our adapter. There are some important methods we have to override to customize the Android RecyclerView behavior. First of all, notice at the beginning, we have created a simple class (MyViewHolder) that holds the references to the row UI components. This class implements the View-Holder pattern. Finally, we override onBindViewHolder that binds our data to the UI. This method, simply, retrieves the data from an ArrayList. According to the current index position, it stores the values into the MyViewHolder. Now that our component is configured and shows the information as a list, it is time to handle user clicks on RecyclerView items. In other words, we want to know if a user clicks on an item and what type of click he is making: simple click or long click. When we use Android RecyclerView the things are a little more complex than Android ListView. In this case, we have to create a class that implements RecyclerView.OnItemTouchListener. We define a callback interface to notify the listener when the user clicks on an item. The first thing is creating an instance of GestureDetector. In this way we can know when a user clicks and what click type he is doing. It is important to note that our class overrides onInterceptTouchEvent to know if the user selects and item and if the gesture detected is handled by our instance. In this class, we override onDrawOver and implements our UI customizazion. At the end of this post, hopefully, you gained the knowledge about Android RecyclerView and how to customize it according to your needs.